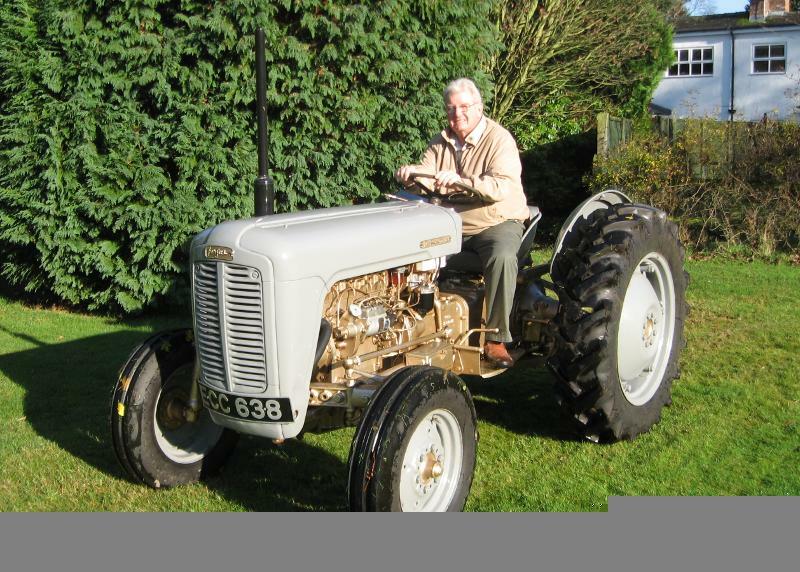 I have been a fan of Ferguson tractors for virtually all of my life and I am sure that many like-minded readers can trace this back to childhood experiences and memories. In my case I have fond memories of haymaking holidays on the farm in the 40s. 50s. 60s. and 70s., owned by my Aunty Ethel and Uncle Frank (both sadly deceased) and situated on Anglesey where the farm land ran along the coastline and where the weather was always warm and sunny -or are my memories somewhat rose tinted !! My Uncle at first had a TE 20 model and I have a photograph of me on this tractor when I was about 5 years old which would be around 1949. Unfortunately the photograph shows little of the tractor so no way of tracing it. Not so however with his next tractor which was a grey/gold Fergie and which I now know he acquired in February 1958. Lurking in the back of my mind over many years was the desire to own a Fergie but I had contented myself with visits to rallies where I knew they would be present. Just recently however I decided that the time was right to try to acquire a grey/gold model with a view to a restoration project and it made complete sense to at least check if the actual tractor from all those years ago was still in existence- and so the search began. After going through literally hundreds of family photographs I came up with about six which showed the tractor over the years but only one which showed the registration number. This was in fact one of the old fashioned 35 mm slides but it showed the tractor pulling a trailer loaded with hay bales and with me riding pillion aged about fifteen. A call to DVLA confirmed that the tractor still existed and that it appeared on their books as recently as 2005. The dreaded words ”data protection“ were mentioned and even going through the correct channels of completing Form V888 and paying the £2.50 fee did not enable them to divulge the name of the current owner. They were able to tell me however that the tractor was first registered on 27th April 1957. It was about this time that I went on the Internet and discovered the existence of FoFH and in particular the Market Place where I placed a short advert under ”wanted“ although I realised that this was an extremely long shot. 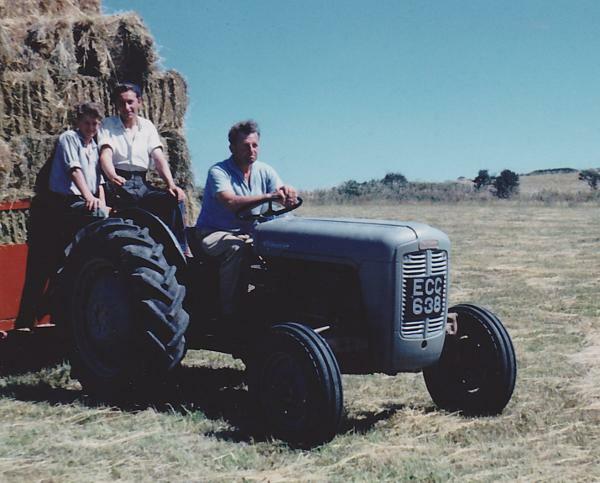 To try to find out more information me and my family drove down to the farm where we used to holiday and, although the current resident had little information, I was able to visit an elderly close neighbour who had good knowledge of the tractor and of course my uncle. He was able to remember that at some stage in the 60s the tractor was painted red and the Ferguson badges removed and replaced with the Massey Ferguson logos. This explained why a lot of the photographs showed a red tractor which I thought to be a different vehicle from the grey gold model and I can only imagine that my Uncle was trying to ”keep up with the Jones“ (quite difficult in Wales) by making it look like a later model. Whilst visiting the farm on Anglesey I was able to have a chat with other local people who remembered both my Uncle and the tractor and the day was spent most enjoyably reliving old times and how the weather was indeed warm and sunny. Not much further in tracing the tractor however. Also as part of my research I contacted Chris Massingham at FoFH who was most helpful and suggested that I contact Caernarfon County Council where the tractor was first registered, as sometimes they have old records. I did this and again they were most helpful and in fact did find a file on the vehicle. I think they were as pleased as I was because it seems that their records have diminished over the years and nine times out of ten they find nothing. For a fee of £2.50 they sent me excellent photocopies of the motor taxation files but unfortunately these did not help in tracing the Fergie. I seemed to have reached a dead end until one evening I received a telephone call from a gentleman who introduced himself as a previous owner of the tractor and with knowledge of its current whereabouts. He had been browsing the FoFH Market Place and had recognised the number. After contacting the current owner he had been given approval to contact me and you can probably imagine my delight at receiving this call. The questions flowed fast but the crucial bit of information was the telephone number of the current owner who I immediately called and made arrangements to visit. It is difficult to describe my feelings on just seeing the Fergie again after so many years, but to see that it was in working condition was extra special. The owner suggested that I have a drive -horror of horrors! My uncle, all those years ago, was very protective of his farm equipment and never let anyone drive the tractor, so I blamed my lack of knowledge on memory and the puzzled owner gave me a quick lesson and off I went down a steep incline and along the road. Then came the crucial question -was he prepared to sell? We parted with his promise to think about it and after a few days waiting he agreed to sell and a price was arranged with which we were both happy and after a further two days I took delivery. My son and I are now in the process of a full restoration but I wanted to share my story of good fortune with FOFH to whom I am totally indebted for their excellent Market Place and for their enthusiastic members.